Please include all specifications (size, color, etc.) so that your order can be filled to the best of your liking. An invoice will be sent to your email address via PayPal. Liz cannot begin to fill your order until payment is received. If any information is left out, Liz will email you asking for the additional information. If you do not respond within a week, your order will be pushed onto the standby list. Any standby orders can be moved back onto the waiting list once any flaws are worked out. If at any time you need to cancel your order or voluntarily push it into standby, please email Liz to let her know and your order will be put on hold. 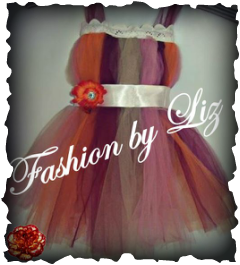 This dress can be ordered in infant sizes only. For assistance in choosing a size, please refer to our children's sizing charts. When placing your order, there will be a point at which you can add special requests. At that time, please specify which size dress you want. You can also request specific colors you would like Liz to include. Please also include your email address and/or telephone number so that Liz can reach you if there are any implications or questions about your order.If you do not include your contact information, it will be virtually impossible to fill your order to the best of our abilities.